With virtually no dairy industry of their own making it, the Chinese have suddenly discovered the deliciousness of American cheese. It's only now that cheese is finally breaking into the world's fastest-growing consumer market. Cheese hasn't historically been a part of Chinese cuisine, and as China has opened up cheese has taken longer to catch on than other Western foods because the taste of cheese is so exotic to the Chinese palate. Thirteen years ago, Notmilk predicted that the health of people living in China would rapidly begin to deteriorate as a result of their developing milk industry and addictive dairy diets. The Chinese have an inferiority complex. They've seen the Japanese people grow an average of two inches over the last two generations (40 years) while their heights have remained stable. In order to attain the same physical growth, the Chinese government has been working closely with America's dairy industry, recognizing that growth hormones in milk are the missing link keeping them from attaining the same stature as the Japanese. The Chinese are developing enormous state-of-the-art 10,000-cow dairy farms, but they do not have the same fully developed power and electric resources as do the Americans or Japanese. Refrigerators are not found in every home. How to cool and store the milk? 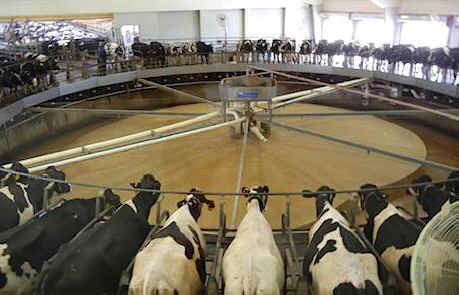 Mechanized milking carousel at a U.S. dairy factory farm. The first Chinese-made fully automatic, milk packing equipment has been manufactured by the Anhui Keyuan Group. They will now put the milk into Parmalat-style shelf stable containers. Perhaps we should send the Chinese some fun-filled x-ray machines, hip replacement devices, and heart valves. They'll soon be needing them. Indigestion? Osteoporosis? Heart disease, asthma, and cancer? Choose one from column A and one from column B. An American menu for American diseases. One glass of milk and thirty minutes later, the Chinese will be wanting more. On December 1, 2010, a peer-reviewed scientific journal confirmed Notmilk's February, 2001 prediction. The journal Breast Cancer Research and Treatment examined breast cancer Mortality rates in China from 2002 through 2008. Between 2002 and 2008, the mortality from breast cancer increased by 201% among urban women. Further studies are needed to understand the increases and to develop cost-effective interventions for elderly urban women in China. For more, visit Breast Cancer. "After all it really is all of humanity that is under threat during a pandemic."